The Joseph M. Bruccoli Great War Collection founded by Matthew J. Bruccoli in memory of his father includes over a thousand pieces of chiefly American sheet-music from the First World War. 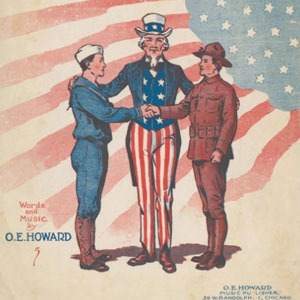 The Collection includes a variety of popular music from marches to rag-time to jazz, pieces made popular by the top performers of the era, themes of patriotism, love, the many roles of women, and the war itself, often with humor, as well as the story of music publishing in the U.S., in particular. It is noteworthy that the Collection includes a number of variant editions. These were quite deliberately collected to illustrate the demand for the most popular songs overtime, while also advertising varying lists of the next group of popular songs.